We planted about 16 pots, plus some dahlia tubers. We have echinacea, black-eyed susan, shasta daisy, lupine, Russian sage, meadow sage, penstemon, two kinds of thyme, and some Iceland poppies. We're hoping to have some plants left by tomorrow. The deer keep raiding the yard, so we chose ones that are so-called deer-resistent. We'll see! Oh yeah, and the knitting continues. I did some hand quilting the other day, but I've spent the past couple of nights knitting for Dulaan. The deadline is fast approaching, so if you are thinking about joining the Dulaan Brigade, better get knitting. Items are due at FIRE on July 1st. Check out the link above and then you can click the Dulaan pdf to see the details (or email me and I can give you the info). 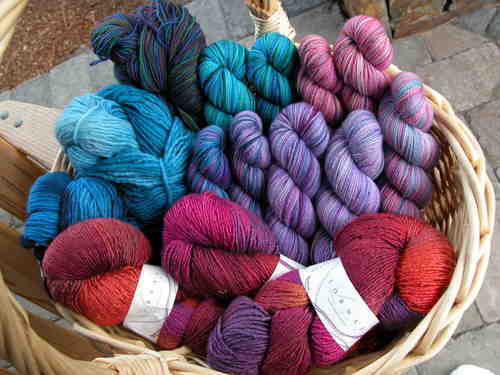 I know I've posted photos of all of these yarns before, but now you can see my whole Koigu stash together. 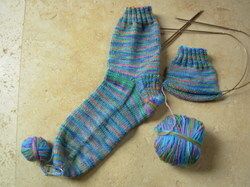 It's all for socks, except for the 5 in a row for the Charlotte's Web Shawl. Why do I love Koigu? It's the amazing colorways and the soft feel. It knits up perfectly for me on size 1's and makes a really comfortable sock. Here I have the KPM (Koigu premium merino- solid red) and the KPPPM (Koigu Painter's Palette Premium Merino- variegated yarns). 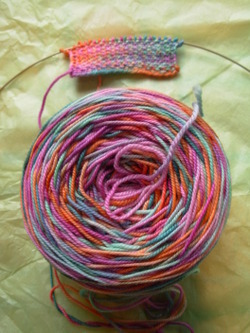 This yarn is so springy and wonderful to knit with. By the way, the wonky Chinese coins quilt top is finished! Now I've got to pin baste and machine quilt it. I probably won't get to that until mid summer. 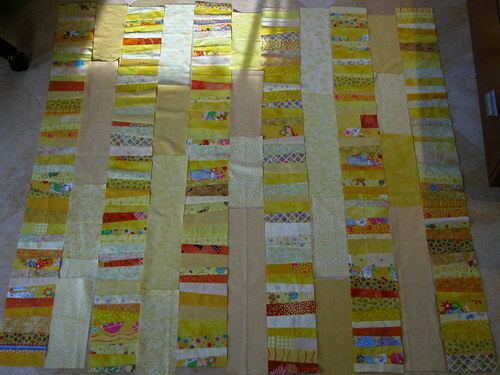 I plan for this quilt to be donated to my quilt guild's Community Quilt program. They collect about 150 quilts each year from guild members and donate them to various charities in our community. It's a wonderful program that brings much needed comfort to many. Juniper! We moved into our home in Bend exactly 2 years ago today. It was just before Memorial Day weekend and it was cold and windy and I think we got hail. Just about what the weather will be like today. I remember at the time thinking, oh my gosh what have got ourselves into! Well, today I'm thrilled to be able to live here and the junipers are part of why I like it so much. 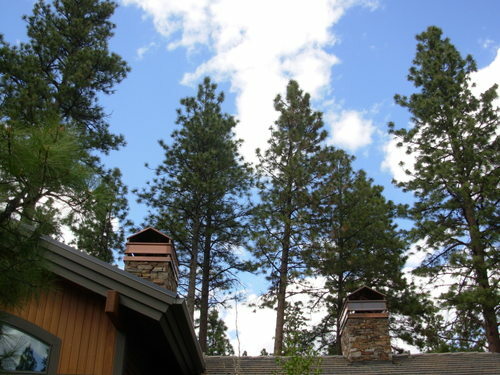 We live on the west side of town, which is slightly closer to the mountains and the national forest. 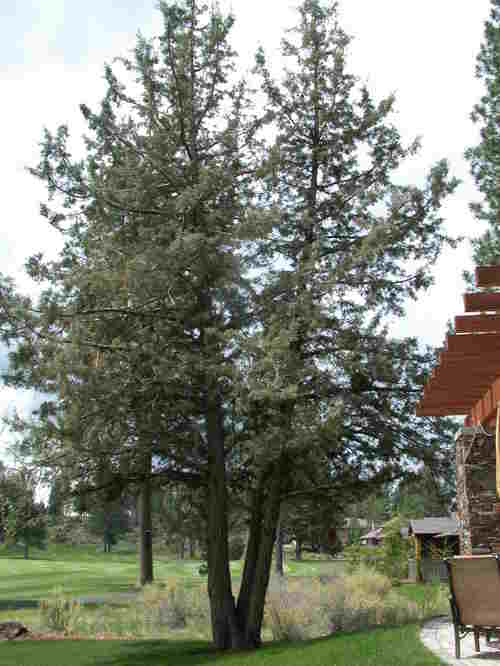 So, we have a lot of pine trees (as evidenced by my mishap I mentioned yesterday). 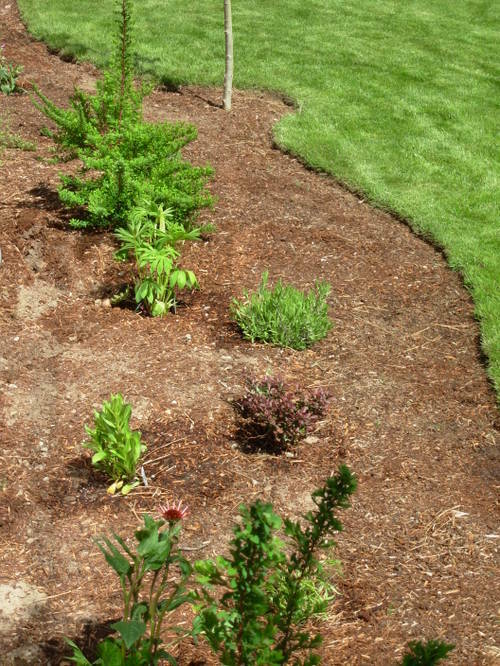 We also have a few junipers, including this one here. This is right outside my kitchen window, so I keep a few bird feeders there (hard to see in this photo). Where we are, the elevation is a bit higher and we get more rain and snow too. As you go east across town you get more deserty. It's drier and the pines give way to juniper and sage. Well, what's so special about juniper? They are not the prettiest trees to look at. Kind of scraggly. 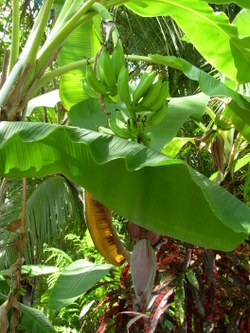 But the scent is so intense, especially after a rain. We've been having a lot of rain lately (thunderstorms too, which I love). My best juniper scent memory is after flying home from a trip last fall. We'd been gone a long time and I was so ready to come home. We landed in a rainstorm and, since our little airport doesn't have jetways, you have to walk down the steps right into whatever weather you have. As soon as the plane door was opened there was a burst of juniper and sage scent. It was amazing and the first time I felt truly glad to be home, here in the high desert! 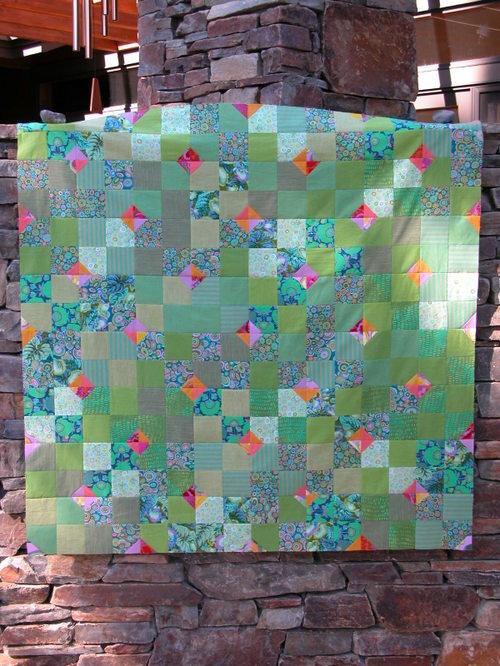 My May PS quilt- Moody Greens is coming along nicely! I've got the center of the top finished and need to add borders. I've also got my batting (I'm giving wool a try) and my hand quilting thread. I'm hoping to have this one done in time to show it at the Sister's Quilt Show in July. 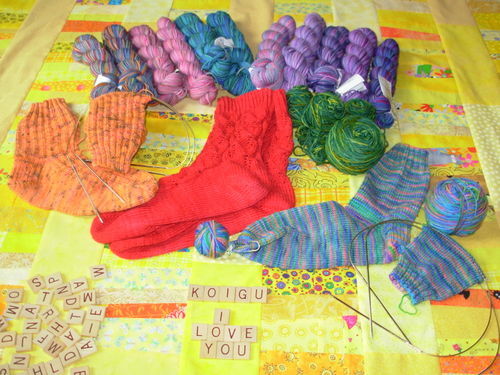 I have a new pair of socks going in Koigu. I call these PS- I Love You because they are in all the colors of Project Spectrum. I did end up buying some green Koigu last weekend when we went to Portland, but I'm disappointed that one of the skeins had about 10 slubs that needed to be cut out. If I'd bought it here, I'd take it back. Anyway, these are lovely and in simple stockinette which is just right for me now. Lastly, here's a new project I've started. It's another Clapotis in the Karaoke that I got from my Secret Pal. 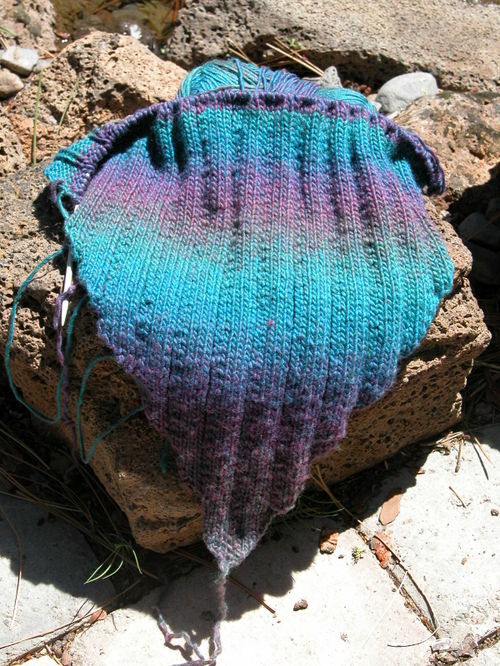 I love this pattern and the colors of this yarn are so yummy! This weekend Chloe and I are going to the San Francisco Bay area to visit friends, go to the art museum, and go shopping. Chloe has a sleepover with her best friend and I've got a dinner date with my Mom's Group friends. I'll also be stopping by my favorite yarn shops- Knitting Arts in Saratoga, Yarn Dogs in Los Gatos and Uncommon Threads in Los Altos. Except for Yarn Dogs, which opened after we moved away, these shops were favorite hangouts when we lived in Los Gatos. It's still a place near and dear to my heart and I'm really looking forward to this visit! Have a great weekend! I updated a few things on my sidebars. There's a new book list. Let's see if I can keep that updated! 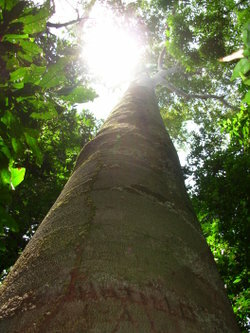 I've also added a bunch of photos to my albums. 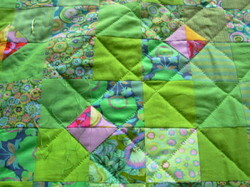 Some of the quilts are from my pre-blogging days that I just remembered I've got digital photos of. The quilt that my sister and I made for my parents is really special- check it out! I also put a couple of new buttons on the right. I'm a part of the One Skein Secret Pal project. I've already heard from my new SP and I've corresponded with my spoilee. It's so funny that we both answered our questionnaires almost identically. Anyway, that should be a lot of fun. 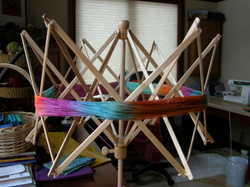 We are supposed to send out a single skein in June and July, then in August a project created from a single skein. 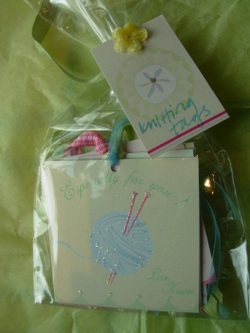 I haven't yet bought the One Skein book, but I have looked at it and there are some pretty cute projects. 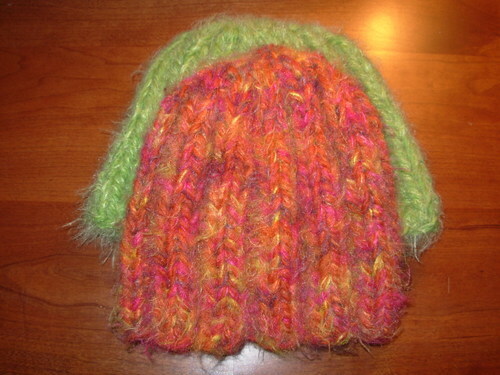 While reading Norma's blog today I discovered the brand-new Trek Along with Me knitalong. I had to join because I've got a skein of Trekking XXL (#68 which will fit in nicely with Project Spectrum's June blue) calling my name and, well, the button is so beautiful. 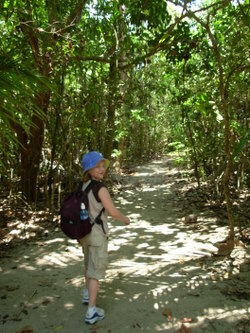 I love to hike and be out in nature. There are lots of great trails around here, so this will encourage me to get out and see something new. 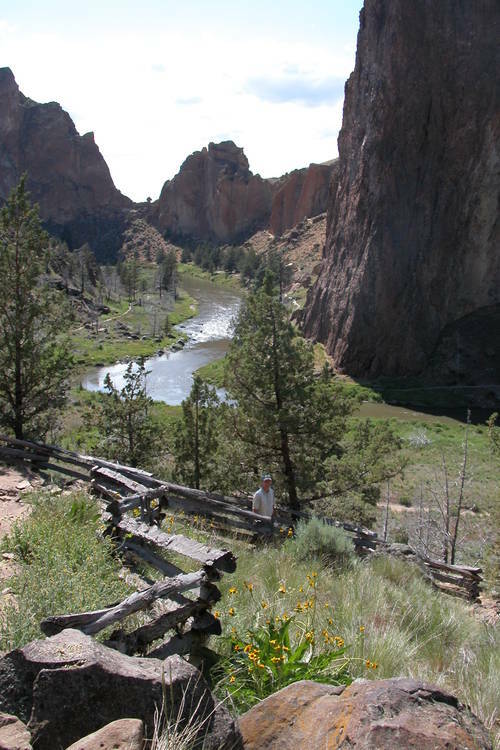 And now for a little blog color, here's one of the great hiking spots in Central Oregon, Smith Rocks State Park. This park is a haven for rock climbers. 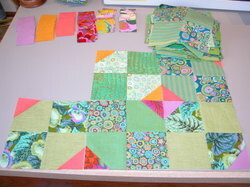 My May Project Spectrum quilt is taking shape and (yay!) I've had enough quilting time to make some real progress this week. 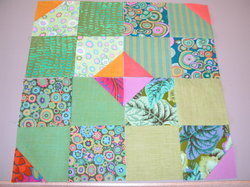 I've decided to do a green version of Kaffe Fassett's Moody Blues from his book, Passionate Patchwork. I've admired this quilt pattern for a long time, but had forgot about it when I was perusing my books. Luckily, I remembered it in time. Moody Greens has the right proportion of color that I'd been looking for. Basically, this pattern doesn't look to value change for it's contrast, but rather to color. So the greens are mostly similar in value. Here's a preview of the blocks. The photos have been washed out with the flash, but you get the general idea. 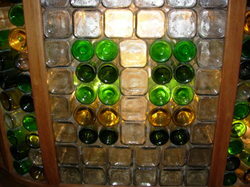 The greens are supposed to blend together and the little bright corners stand out. I've got 64 blocks planned for this one. 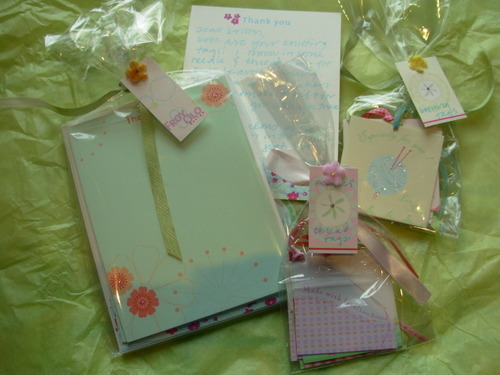 A belated THANKYOU, THANKYOU, THANKYOU, to my secret pal, Becky! She's the lovely and talented quilt artist over at Creative Passage. We had a snafu with the last package (not Becky's fault! 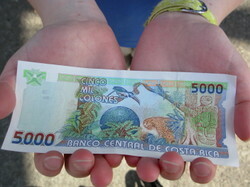 ), but it finally came after I got back from Costa Rica and I forgot to blog about it with the trip we had last week. 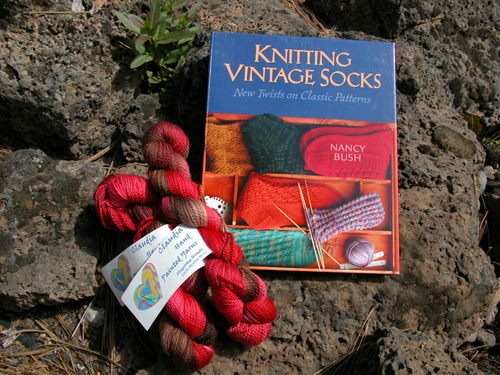 Anyway, I got two beautiful skeins of Claudia Hand Painted Yarns Chocolate Cherry Sock Yarn and the book, Knitting Vintage Socks by Nancy Bush. I'd really been wanting the book and the sock yarn is so pretty! I haven't knit with Claudia's before and I'm really looking forward to trying it. Lastly, I was struck by the way my Rainforest Jasper socks looking in my Birkis and couldn't help taking a photo to show you. 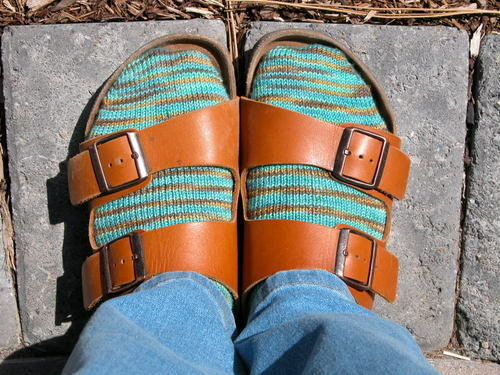 I love my birkis and these socks feel so good! Very happy feet here! This weekend was a good one for quilting. I got a free day and even had the house to myself for a couple of hours. Now you can see my plan with the April Project Spectrum quilt. 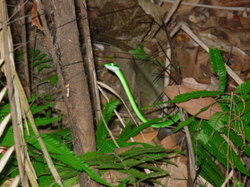 This is not the greatest photo, but has the best color representation of the ones I took. The coin columns have been trimmed to 5 inches wide and the spacer columns have now been sewn, so I have a bunch of long strips that need to be sewn together. Today Chloe begged me to take her to Sisters and the candy shop there, so we went out for lunch, candy, a few geocaches (we only found 1 out of 3, though) and a trip to the Stitchin' Post for a few more green fabrics. 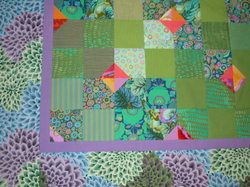 I'm still making a decision about what quilt pattern to use for my green Kaffe Fassett fabrics. Oh, and big news, KF is coming to town in October and I bought tickets for Chloe and I to see his lecture. He will also be doing a workshop with Brandon Mably, but they didn't have the info about that yet. I was so excited because we had just been talking about KF and Chloe is very interested in his use of color. 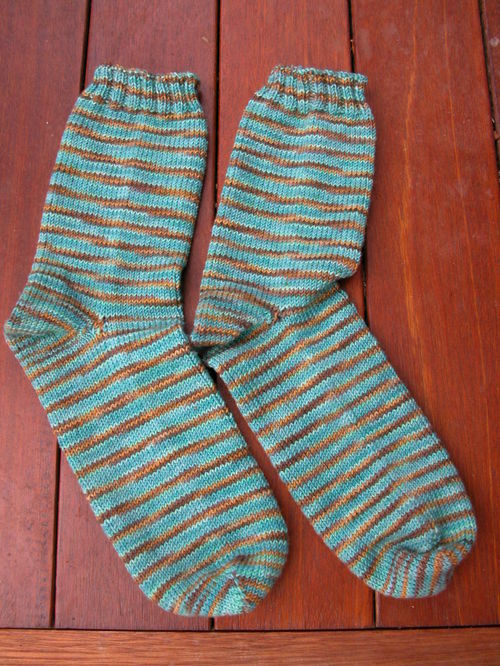 Lastly, here are the Socks that Rock in the special STR Club colorway called Rainforest Jasper. I love the way this yarn striped in the stockinette with 60 stitches, so I didn't end up doing the Cedar Creek pattern which came with the yarn. 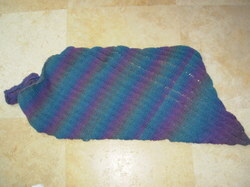 When I changed to 65 stitches the yarn started to pool. I much prefer this striping and the heel is cool too. 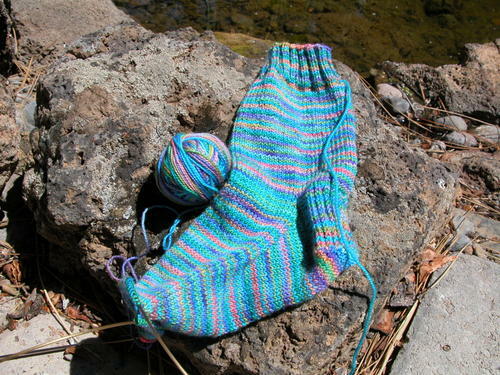 This is Wendy's Generic Toe-up Sock done on size 1 addi turbos. 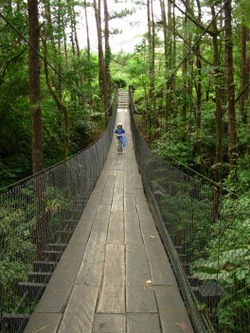 More Costa Rican green! 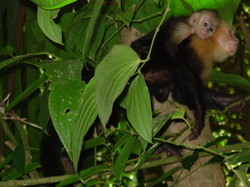 From top to bottom: hanging bridge at Arenal Observatory Lodge, green bananas in Manuel Antonio, Chloe walking in Manuel Antonio National Park, locust tree in MANP, bar bottle wall in El Avion (restaurant in Quepos), mama and baby White-faced Monkeys in MANP, Green-headed Tree Snake in MANP, 5000 Colones bill (worth about $10.00 US- isn't it beautiful, I wish our bills could be so pretty!). 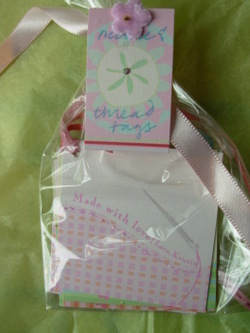 All photos are clickable to see the details!